Musings on Realities: It's Been a Busy Week! Just a short post to tell you about what we've been doing these past seven days! We removed the carpet in our dining room and hallway to make way for a new hardwood floor. This is my monkey scrubbing the floor with bleach. Our kittens had a couple of "accidents" and we wanted to get rid of any lingering smell before the new floor goes in. 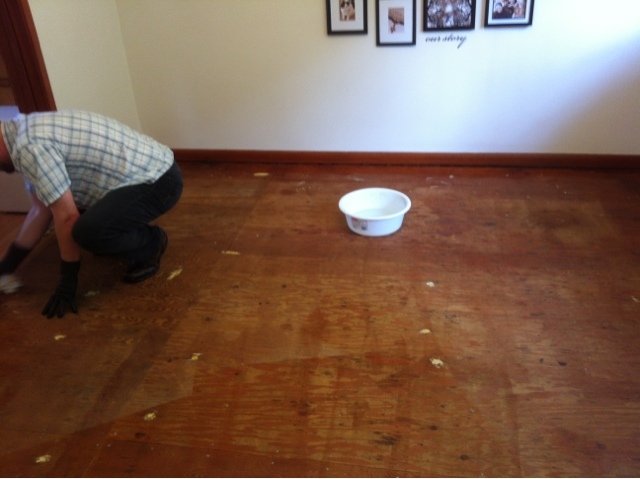 We're now down to a plywood floor which feels great on the feet but is littered with nails and patches. It will be nice to get the new floor laid down.